The beautiful resort town of Gordon's Bay hugs the coastline in a corner of False Bay. Stunning views across the bay to Cape Point and Simon's Town take ones' breath away. Bikini Beach, near the Old Harbour, is a favorite with the locals. Sit on the harbour wall and watch the yachts come back from a day on the water. 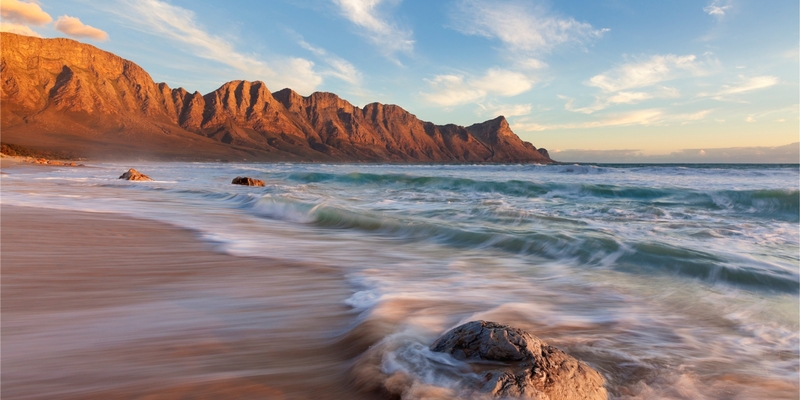 In the season, you may even see whales along the coastal road to Pringle Bay. The new harbour at Villa Via offers restaurants and bars to party the night away. The excellent facilities of Somerset Mall are not far away, as are the schools and medical facilities on offer. The town of The Strand is only 10 minutes drive, and also offers additional shops. Gordon's Bay is a favorite with holiday-makers who fall in love with the town and invest in property. Recent expansion has lead to a number of new properties being constructed, and in most cases these newer properties offer exceptional value. Residents enjoy wandering down to the coast line, and throwing a line in the water off the harbour wall. Relax on the beach, paddle-ski, windsurf - or just enjoy the holiday atmosphere Gordons' Bay offers. Gordon's Bay offers 4 distinct locations to property purchasers: The Old Village, the Mountainside, the Lower-lying areas such as Dobson, and Harbour Island. Each area has it's own unique flavour, and will appeal to different tastes and price ranges. Gordon's Bay generally offers great value to purchasers, and is also popular with international and up-country purchasers who love the location right on the coastline - and the incredible views that many properties offer. Feel free to search our Website for Gordon's Bay properties. We have full details on all our listings, with multiple photo's, and floorplans in many cases. As we generally only list our Sole Mandate properties, you usually won't find these listings anywhere else. Please contact the listing agent for more information, or an appointment to view.